Intensive 4 days Classroom/LVC Training and 2 months LIVE Project mentoring. This course "Data Mining", is designed for candidates with or without programming skills, with basics of Data importing and Data mugging along with effective programming techniques. This also includes Python Data Science challenges kit, enabling the candidates to not only understand Python core concepts but also gain practical mastery over Data Mining with Python, which is very much in demand in Today's Data Science job opportunities. It is estimated that over 70% of potentially useable business information is unstructured, often in the form of text data. Text mining provides a collection of techniques that allow us to derive actionable insights from these data. In this course, we explore the basics of text mining using the bag of words method. 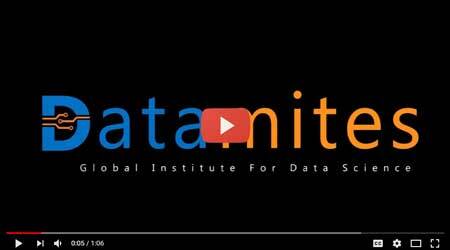 Become an expert in this lucrative "Data Mining" field with DataMites's training program. This Data Mining program provides requisite knowledge on concepts of Data analysis using R language and also the techniques of Machine learning and Text Mining. These are the most premier and demanding concepts needed to analyse the huge volume of data from different perspectives to gain better business insights. By choosing this DataMite's "Data Mining" course, it allows you to set your complete focus on these specified topics, R language, Machine learning and Text Mining to gain a specialisation. Why this course "Data Mining"? Your big career move is all set now, as this Data mining course focuses on specialisation of skill set involving the techniques of Machine learning, Text Mining using the R programming language. Opting this course would be a perfect idea to explore, analyse and leverage data in order to arrive at valuable information for your company. A complete knowledge about the R tool starting from the scratch of installing the tool. Acquire a thorough knowledge of the tool, also gain a better insight of Data manipulation as well as Data visualisation using the tool. Gained an in-depth knowledge on this artificial intelligence Machine learning, which is a much demanded one in all the companies for an effective and powerful analysing of their business data. Both the foundation and Expert level are covered in this program. Have attained the knowledge of Text mining and the major techniques used for mining and analysing the text data to derive at useful knowledge for the company. Also would have learned the statistical approach handled on text data with no or minimum human effort. Data Mining is a powerful tool that many companies want to adapt in order to increase the accuracy of results they arrive from their raw data. Since the companies are readily interested in applying these new technologies for their data analysis, there is already a steep growth of opportunities in this field. Though the data mining concept is not pretty new and has been there for decades, it is becoming popular because of increased amount of data, fast processing and reduced cost in storage. As a Data Analytics professional, after completing this course you would see an increased growth in your career. Any professionals who are aspiring to make a career in Business analytics using R language in Text Mining and Machine learning can choose this course. Even as a beginner, if you want to take a specialisation by learning R language along with text mining and machine learning then start right away with this course. "Our search for world class career ended at DataMites" is what, quoted by all of our candidates. Only experts with real time experience and better understanding of concepts can teach the candidates well. True, we have world class faculties who can make you understand even the toughest concepts at ease. DataMite's certification that you acquire after completing this course has industry recognition and adds weightage to your resume. When do the course start? This online Data Mining course starts on the first day of your enrolment. Can I attend classroom sessions? We are not supporting classroom sessions as of now and would definitely come up with it soon. Will I be able to access this Data Mining course even after I complete it? You can access the course materials and videos only during the course. Due to copyright issues, it is not available after the course. The following topics are covered under this topic "Data Mining using the R tool"
The following topics are covered in "Machine Leaning"
Datamites 5 out of 5 based on 21 ratings. 21 user reviews. Training was excellent.trainer given good concepts and examples. Trainer was provide good examples and excellent concepts explained. Very interesting classes with good practical industry related examples while teaching. The training was knowledgable and good to so for taking the certification exam. Training was easy to understand concepts explained. Awesome Information , training module the trainer. Very good Training with live examples and good concepts explained. Satisfied by the training programme. Very informative and comparing concepts with the real scenario helps to understand the concept better. Excellent and very good content and presentation. Thanks again for the efforts.